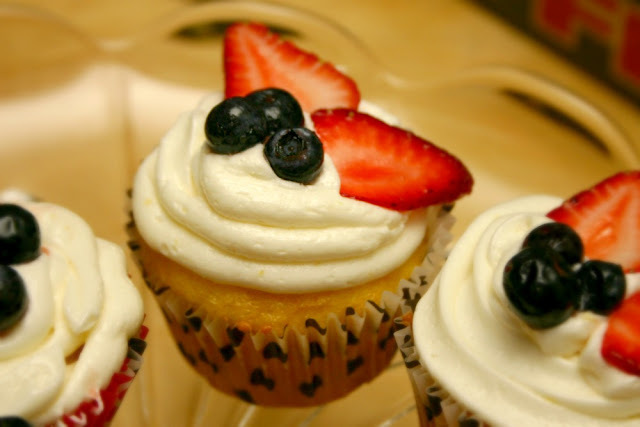 The Red Gingham: Lemon Cupcakes with Berries + Happy 4th! 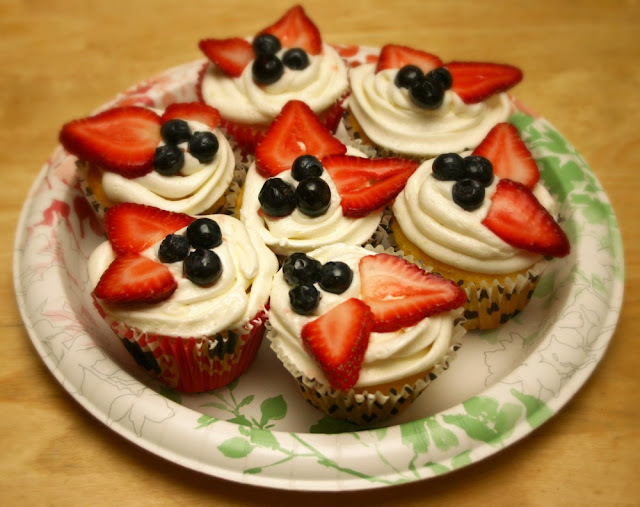 Lemon Cupcakes with Berries + Happy 4th! Happy 4th everyone! Hope you had a nice cookout and celebration. 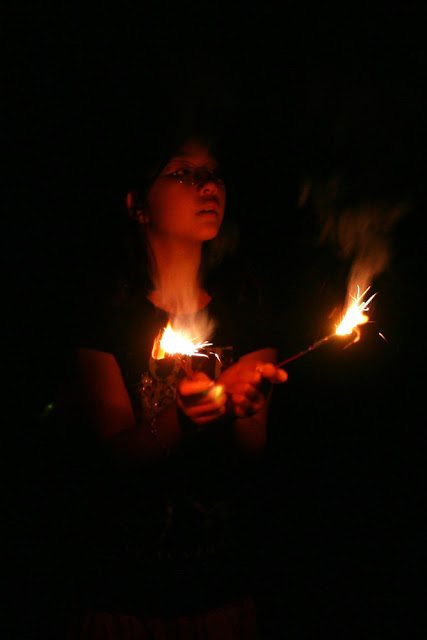 As I write this, fireworks are still going off in the neighborhood. I guess the doggies will have to remain in hiding just a little while longer. While we did celebrate Independence day, we went the low key route this year and spent most of the day lounging around. At about 6 p.m., we got a couple of chilled beers out for the adults and threw down some hot dogs and hamburgers on the barbie accompanied by some grilled sweet corn and roasted potatoes. For dessert, I thought I'd whip up something more decadent such as these lemon cupcakes topped with a lemony butter cream and sliced strawberries and blueberries. 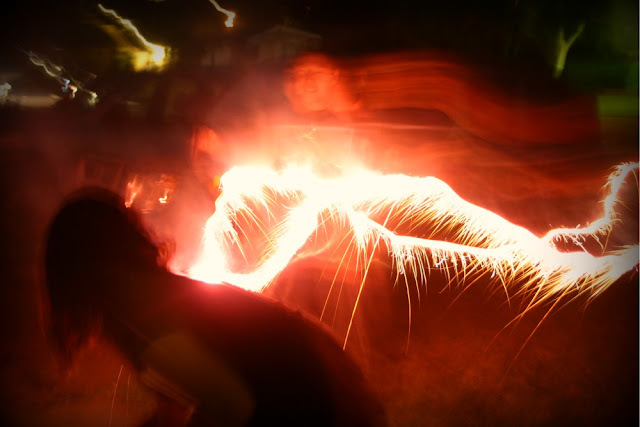 After dinner, we set off a small box of fireworks and of course, plenty of sparklers. All in all, we had a great day. 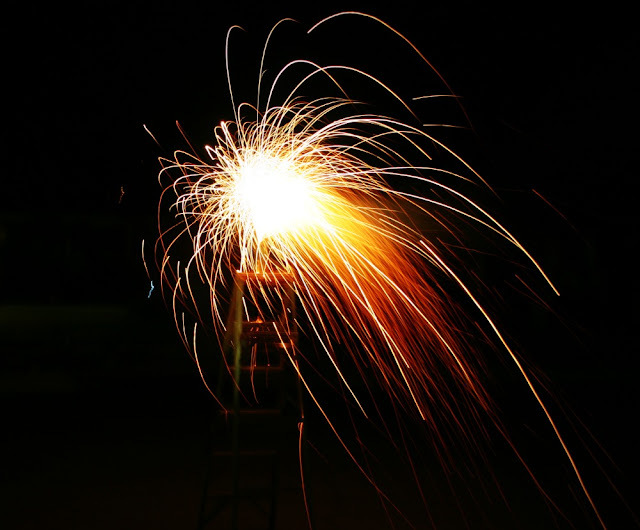 How did you celebrate your July 4th? 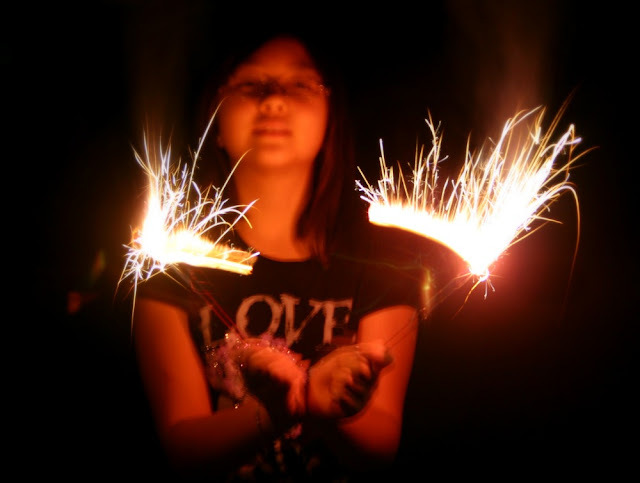 Sparklers...everyone's favorite for July 4th. Fresh berries really made the cupcakes shine. Adapted from Allrecipes.com. Makes about 20 cupcakes. 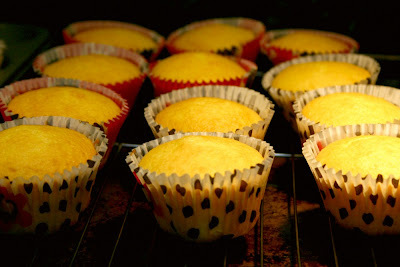 Preheat oven to 350 degrees and line your cupcake pan with liners. Sift the self-rising flour and salt together in a bowl then set aside. Using an electric mixer, beat the butter and sugar until light and fluffy then add the eggs one at a time. Beat each egg until fully incorporated before adding the next. Next, add in the vanilla extract and lemon zest. Slowly add the flour mixture into the butter mixture, one third at a time, alternating with half the milk and half the lemon juice after each of the first 2 additions of flour. Beat until just combined. Make sure not to over mix. Fill the prepared cupcake liners with the batter until about 3/4 full and bake in the preheated oven for about 15 to 20 minutes or until a toothpick inserted in the center comes out clean. Let the cupcakes cool in the pans for about 10 minutes before removing them to finish cooling on a rack. 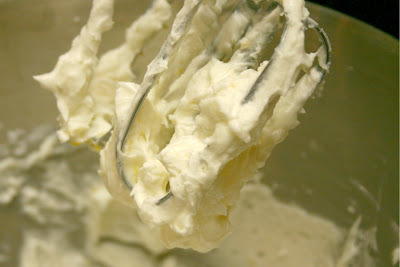 Using an electric mixer, cream the butter and sugar together on low speed until incorporated. Increase the speed to medium and slowly add the milk, lemon juice, lemon zest and vanilla extract. Continue to mix for another minute, adjusting the consistency by adding more milk if necessary. The frosting should be spreadable and somewhat stiff but not runny. 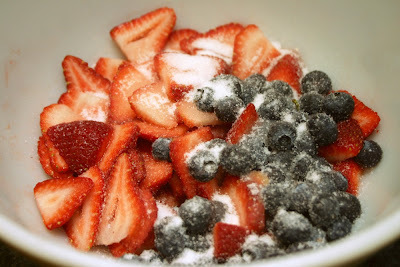 Place the sliced strawberries and blueberries into a bowl. Add the lemon juice and sugar then toss together to coat. Place the frosting into a piping bag with your tip of choice. 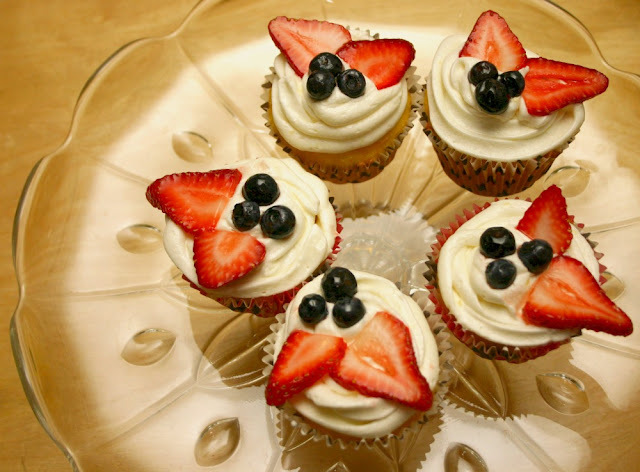 Pipe the frosting onto the cupcake then top with two slices of strawberries and several blueberries. Serve immediately. If they have been refrigerated, allow to come to room temperature or allow frosting to soften before serving. This plate of cupcakes were sent over to our neighbors' to thank them for lending us a drill this week. 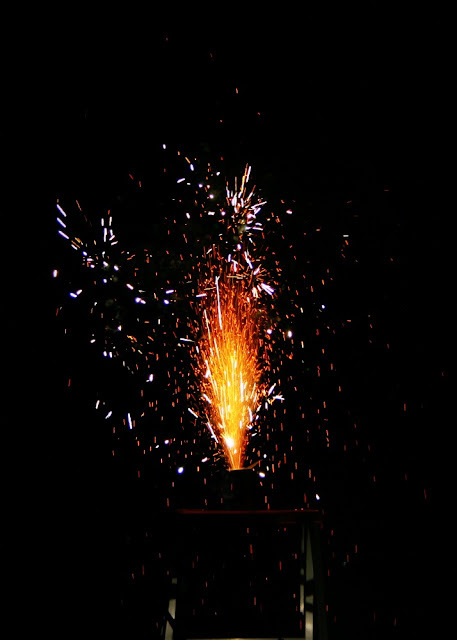 A few pics from our little fireworks display.